Select a book, click on “Add to Cart” button to go to PayPal page to verify selection and quantity. You may check out to complete your purchase or click “Continue Shopping” at top right to make additional selections. Sample pages are available with each book description. International customers should contact paleo@hgms.org directly so that the correct postage can be determined. Description of 148 Texas Cretaceous Echinoids. Classification. Illustrated morphological terms and glossary. Genera and species lists. Reference list. Collecting localities. 260 genera and 604 species Texas Cretaceous Ammonites and Nautiloids described. Illustrated morphological terms glossary. Faunal lists. Classification. Synonymies. Reference list. Genus Comparison Charts. Over 200 drawings and illustrations. 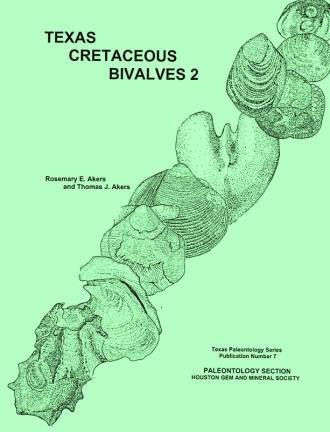 176 genera and 573 species of Texas Cretaceous Gastropods illustrated and described. Illustrated Glossary. Genus Comparison Charts. Reference list. Classification. Annotated list Synonymies. Descriptions and illustrations of ALL named Texas genera (185) and species (816). Illustrated glossary. Morphological terms. Steps to identification. Classification. Synonymies. Reference list. Annotated list. Genus comparison charts. Bivalve formation lists. Genera and species indices. 401 figures. 516 pages. A ten-year study of Middle Eocene invertebrate fossils from the Stone City Bluff locality on the Brazos River in Burleson County, Texas, revealed a large fauna, including 61 species recorded for the first time from this famous site. Four phyla (Annelida, Bryozoa, Coelenterata and Mollusca), including 72 families, 128 genera and 220 species, are identified and illustrated. One specimen from Phylum Brachiopoda is illustrated but not identified. The stratigraphy of the Stone City Bluff recognizes three Middle Eocene formations. The Sparta (oldest) is overlain by the Stone City and Cook Mountain formations, respectively. These formations are included within the Claiborne Group and are age-dated between 43 to 46 MYA. All fossils are derived from marine units overlying the deltaic Sparta. This study represents the first attempt to completely collect, categorize and illustrate the entire invertebrate fossil fauna from Stone City Bluff. It will be a useful reference for collectors and scientists studying Middle Eocene localities in Texas and the central Gulf Coast Plain. Macro and Micro high resolution photographs of the 208 pieces donated to the museum. Most localities are located on maps, photographed and described by GPS latitude and longitude. The geological age and formation for most specimens are provided. Supplemental pieces of fossil wood from the author’s collections are also described to expand the data range from Devonian to the Pliocene. The specimens are identified to family and sometimes genera, particularly the ones from the author’s collection. Articles on special pieces, petrification, and localities. 500+ photographs. This product is written in HTML and runs on PC and MAC on Internet Explorer, Netscape, Mozilla, Mozilla Firefox. and is published on CD. 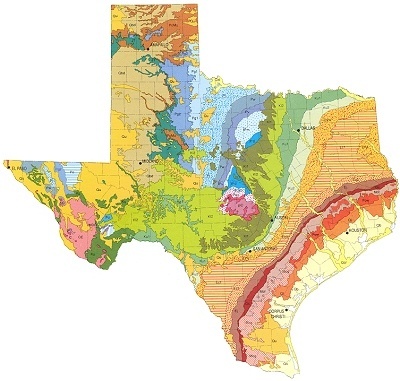 This 28 by 36 inch map shows the geology of Texas and major highways and cities. I expect that you will wear these out while your travel in Texas.